GE is planning to help hardwire a city of 1.5 million for smart grid. Is everyone now eyeing China? Today's big news in Smart Grid is General Electric's (NYSE: GE) announcement that they will partner with The City of Yangzhou (located nearly 175 miles northwest of Shanghai) for a 3-phase project, beginning with the opening of a 10,000 sq meter demonstration lab, and culminating with a city-wide deployment of various end-to-end smart grid technologies -including advanced metering, distribution automation, and in-home monitoring displays - expected to take place in 2012. While you may or may not have heard of Yangzhou before, with an urban population of 1.5 million people (and another 3 million in the surrounding areas), its population is roughly equivalent in size to Philadelphia and nearly double the city of San Francisco, and will now serve as a launch pad for GE's Smart Grid ambitions in China. 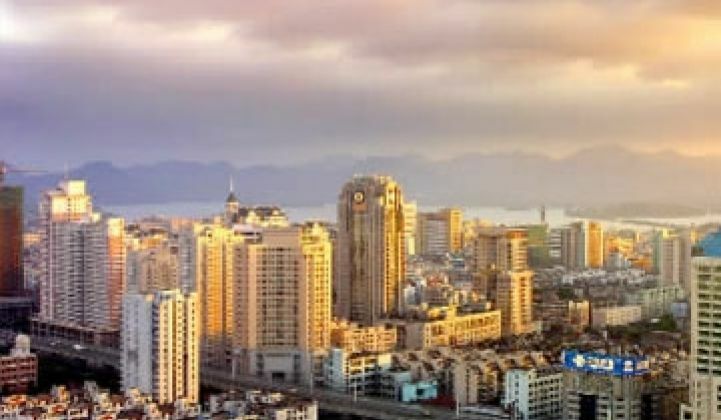 Yangzhou's New Economy and Development Zone, now in its eighth year of operation has reportedly attracted more than 200 business enterprises from over 20 countries, and has developed six major industrial blocks (which are: electrical & mechanical equipment, electrical appliances, electronic information and new materials, textiles and light industry, automobile trade and logistics and high-level real estate development). GE is, of course, looking to deploy an end-to-end or "holistic" suite of solutions in China. Phase 1 (the build out of the demonstration center) will simulate WiMAX to roughly 25 smart meters, demonstrate outage management and restoration management, as well as time-of-use rates. There will also be in-home displays with programmable thermostats and battery storage as well as the demonstration of renewable integration on display at the Yangzhou demonstration. Phase 2 will be the addition of distribution automation technologies, and Phase 3 will be the actual city wide deployment. Many industry observers have pointed out that one of the great advantages related to smart grid projects in China, is that unlike the in the States and in Europe where you have countless utilities and regulatory groups to deal with, in China, State Grid is more or less the only game in town. While not mentioned in the press release, one would think this announcement would also be very good news for GE's technology partners, such as startup Grid Net, who provide the policy-based network management software for the new GE WIMAX smart meters.